Capturing the essence of lilacs! 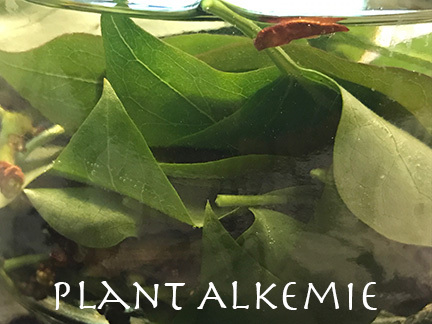 | Welcome to Plant Alkemie! Home » Aromatherapy » Capturing the essence of lilacs! I love the scent of lilacs. But it is hard to buy an authentic natural lilac scent. Nearly all lilac scents on the market are synthetic. Lilac essential oil isn’t available since lilacs don’t yield an essential oil when steam distilled. So if you see someone claiming they sell lilac essential oil, they are either very misinformed about their product, or they are trying to dupe you: they are really selling the synthetic fragrance oil and calling it an ‘essential oil’. There is a natural lilac aromatic called lilac CO2 extract but it is very expensive: the retail price is several hundred dollars for an ounce! I have not used it but I recently had the opportunity to smell it (both the undiluted, as well as a dilution). It smells heavenly, and I hope to buy some in the future. (Note: since the writing of the article in 2017, I have bought, used, and blended with lilac CO2 extract. It is exquisite!). Sometimes you may find a natural blend (that isn’t made with lilac CO2 extract). Other natural perfumers sometimes combine different natural aromatics like essential oils, absolutes, etc. to mimic the scent of lilacs, so these blends and perfumes, while plant derived, are not composed of true lilacs. Other perfumers may use a mix of both (non-lilac) natural and synthetic ingredients to mimic its scent. And a very few perfume artisans might even use (real) lilac tincture, lilac infused oil, lilac enfleurage, or lilac CO2 extract, but they may or may not add other aromatics to it. So it can be hard to capture the scent and essence of lilacs, unless you pay a lot for the CO2 extract or have access to fresh lilac! I have been experimenting for the past few years to make a truly natural lilac product using the fresh flowers. I usually make both lilac infused oil and lilac tincture. Though many people use dried herbs in their infused oils and tinctures, there are many cases when it is necessary to use fresh herbs. For lilacs, fresh flowers need to be used, since dried lilac doesn’t have much scent. It can take a while to learn how to make them well, since using fresh flowers can cause a couple of issues, especially when making the infused oil. Fresh plant matter increases the chance of microbial contamination in herbal infused oils, so care needs to be taken when making them. In addition, if made improperly, an off note can develop in lilac infused oil. In other words, it may not smell too pleasant! I’ve found that the off note is less likely to occur in lilac tincture. Over time I’ve used certain techniques to help ensure a pleasant smelling infused oil and tincture. My results have been good (no off notes), however, the scent of the infused oil and tincture are extremely mild. Some people expect them to smell as strong as a diluted essential oil, but they don’t smell that strongly. The strength of their scents are akin to authentic unscented monoi oil (gardenia flowers in deodorized coconut oil). Most monoi oils on the market have an added scent to them and smell very strongly, but if you’ve smelled one without any added fragrances (which can be hard to find), then you know what I’m talking about! It has a very light, floral, almost sugary back note. Or if you’ve tried coffee flower infused oil: it’s a very light and lovely scent. Lilac infused oil and tincture are the same way—if you only infuse it once, the scent is very light. You can make the scent stronger by infusing several times, but that will take a lot of flowers. When you infuse fresh flowers multiple times, the scent can be quite strong and perfume strength! But a batch and all that work can quickly be ruined if an off note or mold develops so be careful when making them! For lilac infused oil and tincture, use fresh flowers. Some people wilt flowers for one to a few days but it may get too dry and lose its scent quickly. Others use dried flowers but I don’t recommend that as dried lilacs don’t have much scent. I recommend using fresh flowers within a few hours of cutting them—this will give time for any bugs to leave. I have gone up to 12 hours after cutting lilacs (stored in an open plastic zip lock bag, in a cool area, and NOT wilted) before using them but I wouldn’t go much beyond that. 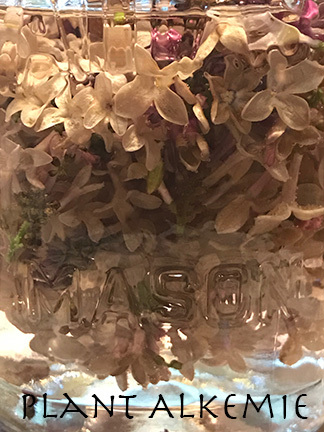 To make the infused oil or tincture, I remove the lilac flowers from the leaves and stems, and place the flowers in a glass jar. I then cover them completely with a carrier oil or a blend of alcohol plus distilled water. For lilac infused oil, I like using jojoba oil—which is really a liquid wax with a super long shelf life–but you can use any low to no scent carrier oil you like, if you keep shelf life in mind. For the tincture, I use about a 75% concentration of 190 proof alcohol and 25% distilled water to account for lilac’s natural water content. 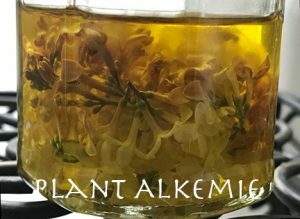 I usually infuse the carrier oil for just 3-7 days before removing the flowers (usually 3-4 days but I have left them in for as long as a week), and for the tincture I may infuse for 6-8 days (until the color is gone from the flowers and the alcohol/water mix is colored). Make sure the flowers are completely submerged under the solvent (sometimes the flowers will float; just check on it daily, push them down below the surface, and do the best that you can). Infuse, strain, and there you have it! Add an antioxidant like vitamin E to the infused oil, and keep it in the fridge or another cool, dark place, for best results. Since the infused oil is made with fresh flowers, I only make very small amounts of it, and use it up quickly. You could infuse the infused oil and tincture multiple times to strengthen the scent. But if you plan on infusing the tincture many times, use only 190 proof alcohol and do not add any distilled water to the alcohol. This is to account for the water content from the fresh flowers. I also infused the leaves this year, as the historic herbal uses for lilac that I’ve seen are usually for the leaves or fruits. But the reason I made it is because I was mostly just curious if the leaf tincture would impart a scent too. It seems to have: its fragrance is slightly floral and very green. I usually only infuse the flowers once as I don’t have a lilac tree. My sister and her family usually kindly gift me with a little lilac from their beautiful, special tree each year. I usually just make a couple ounces of the infused oil and a few ounces of the tincture, which is enough tincture to last me for the year, as long as I use it sparingly and occasionally. I use the infused oil much more quickly than that though. But it is something that I look forward to making and using yearly. It is a precious gift from the tree and the hearts of my family. I use lilac infused oil and tincture for their barely there, mild scent. The scent only lingers on the skin for a few minutes, and it isn’t strong enough for a perfume (since mine are only infused a single time), but I still enjoy it. I use them mostly for energetic purposes. To me, lilac represents spring, new beginnings, femininity, innocence, and emotional love. In addition, making the infused oil and tincture helps me connect spiritually to the plant. 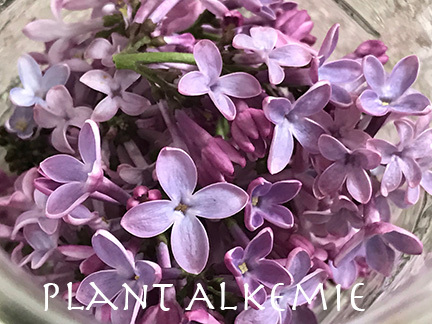 And working directly with lilac helps me better understand the plant from a botanical aspect: I observe the growth patterns, shape of the leaves and flowers, and more, as I am processing the plant for my infused oil and tincture. Lilac is thought to have some skin benefits too. I like using the infused oil on my facial skin! Great piece. Thanks for sharing Li. Thank you so much Madeleine! Have a wonderful day! very nice. We celebrate our annual “Lilac Festival” here in Rochester NY mid-May. Our Highland Park has thousands of lilacs – plus many other flower beds, trees, etc. Lilacs grow everywhere around here – mine (“Sensation” variety) is in full bloom by my deck right now! I want to pick some and infuse it now! Hi Bonnie, that sounds lovely! Wow, I’ve never seen that many lilacs; that sounds like a sight to behold! I hope you get to infuse some soon! I’ve been doing this same experiment, and have had some success as far as getting a decent scent. Thanks for this piece! Lovely article! How do you work with lily of the valley? Thanks Colleen. I personally haven’t worked with lily of the valley. But I’ve worked with other fresh flowers like jasmine, rose, and magnolia. I guess you could try infusing lily of the valley in a similar manner (it may need more or less time than what I stated). Have a great night! I grew up with lilacs. This brought back memories. Thank you Li. That is wonderful that you grew up with lilacs, Tara, and I am so glad it brought back a lot of good memories for you! Good night, my friend! Li, what a great article and also a beautiful site. Congratulations! Thank you Sue for your kinds thoughts! Take care! Very nice article. Lilacs are one of my favorites. Grew up with them and now have 3 planted in my yard, sadly the bloom time is so short-lived. Oh Li Wong, this is a wonderful article. When Lilacs were mentioned as a possible Essential Oil I wondered if such an EO existed. Now I know. Thank you so much for sharing. Your family is wonderful to share their tree with you. My Lilac tree seemed to bloom one day and the blooms gone the next day. Hi Tannis, thanks! I am glad you like my article! Yes, my family is so sweet to share their tree with me. Have a nice day! Enjoyed your post! You should consider a visit to the Lilac Festival on Mackinac Island (Michigan). Many of the trees there were brought over from England and France and are over 200 years old. Truly a magical event for anyone that loves lilacs. My neighbor has a lilac tree and when the breeze catches its scent, I just have to stand still and take in as much as I can. I can understand why you’d want to capture that loveliness and I wish you continued success in your efforts! Thank you for sharing! Thank you Heather! I do the same thing with my sister’s tree–I just stand there and breathe it in! Have an amazing day! Lilac is one of my favourite shrubs. Excellent article Li! Thank you for adding your knowledge & experience to the world of herbalism & aromatherapy! I will look forward to reading more from you! Thank you Carol! You are too sweet! 🙂 Have a wonderful night! Thanks for the very informative article Li! You’ve done a great service by warning potential buyers about to avoid lilac essential oils which are not C02’s, as well as providing instructions on how we can make our own Lilac oil infusions and tinctures. Loved hearing your thoughts on good applications for Lilac aromatics too. Thanks Angie! I am glad you enjoyed my article on lilac tincture and lilac infused oil. I hope people like my article on aroma and citrus infused oils too. I appreciate you sharing the link to my old article. I will be writing articles on infusions (herbs steeped in water/strong medicinal teas) in the near future. Take care!